The main point behind searching any virus is identifying the code structure of its virus file. Suppose, we’ve found the following virus in computer. Now we’ll see the Binary code of this file.... 12/10/2018 · Do not shutdown the computer too early. It may not scare the victim or may not look like a virus. Alternatively, set your 'virus' to execute every time a user logs in. Navigate to Start > All Programs > Startup (Right-click) > Open and copy the shortcut into the folder that opens. Welcome to the Computer Knowledge tutorial on computer viruses. We’ll discuss what they are, give you some history, discuss protection from viruses, and mention some of the characteristics of a virus … functional anatomy for sport and exercise pdf The main point behind searching any virus is identifying the code structure of its virus file. Suppose, we’ve found the following virus in computer. Now we’ll see the Binary code of this file. 24/10/2018 · A computer virus is a small software program that spreads from one computer to another and interferes with computer operation. A computer virus might corrupt or delete data on a computer, use an email program to spread the virus to other computers, or even delete everything on the hard disk. 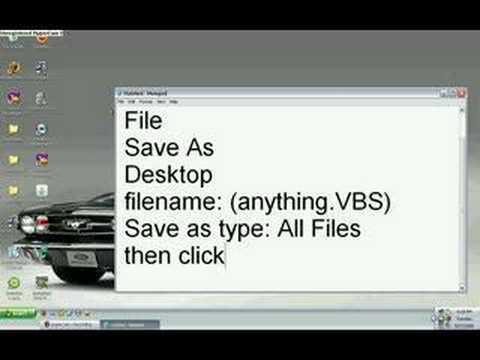 how to create a website from scratch pdf In this post i will teach you to make simple yet very powerful or you can say dangerous computer virus using a batch file. No software is required to make this virus, Notepad is enough for it. The good thing about this virus is it is not detected by any AntiVirus. How to make 3 harmfull viruses in less than 2 minutes! 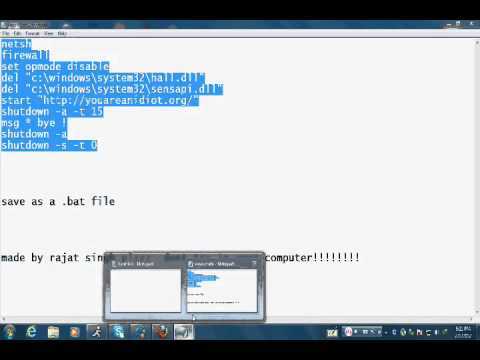 .bat stands for batch file, it is a series of commands executed through command prompt, not a virus. However this can cause damage to the computer's cpu if you don't have a good cpu fan or heat sinks you could crash you computer, which also could lead to your computer dying. The effects a virus can have on your computer depends on how its been programmed to spread. Programming can be one of two types: resident and nonresident. Nonresident viruses are made up of two processes -one finds files on your computer to infect, and the other duplicates the virus within the files that have been found. Make sure that your virus signature files have been updated. Steps for Handling a Computer Virus If you perform a virus scan on your computer and the scan locates a virus that crept in and camped out on a file somewhere, you’ve got a “situation” on your hands.